Derek Mackay MSP is encouraging his constituents to use a charity’s new hearing aid support drop-in service in Renfrew. The MSP for Renfrewshire North and West visited Action on Hearing Loss Scotland’s new monthly Hear to Help drop-in in Renfrew Library to see service coordinator, Lainey McFarlane, and volunteer, Jane Jones, support local people who would otherwise need to go to the audiology department at the RAH. The Hear to Help service readjusts, cleans and re-tubes NHS hearing aids as well as supplying new batteries. Information about assistive equipment such as amplified phones, TV listeners and vibrating/flashing alarms, which can make life easier, is also provided. The charity is looking for volunteers in Renfrewshire to come forward help the service for just two hours every month. Training will be provided by NHS Greater Glasgow and Clyde’s audiology department and the new volunteers will also receive an induction by Action on Hearing Loss Scotland. “I’ve visited the Hear to Help service in my constituency before, so I’m aware of the valuable support provided in Erskine Library and the Bridge, Bridge of Weir, especially for older people with mobility difficulties who are saved from travelling to hospital for low level hearing aid maintenance. “I am delighted to see this service is now being delivered in Renfrew Library so that local people struggling to adapt to their NHS hearing aids can find out how to use the volume or loop controls and understand the importance of changing their batteries and getting the tubes cleaned or replaced. 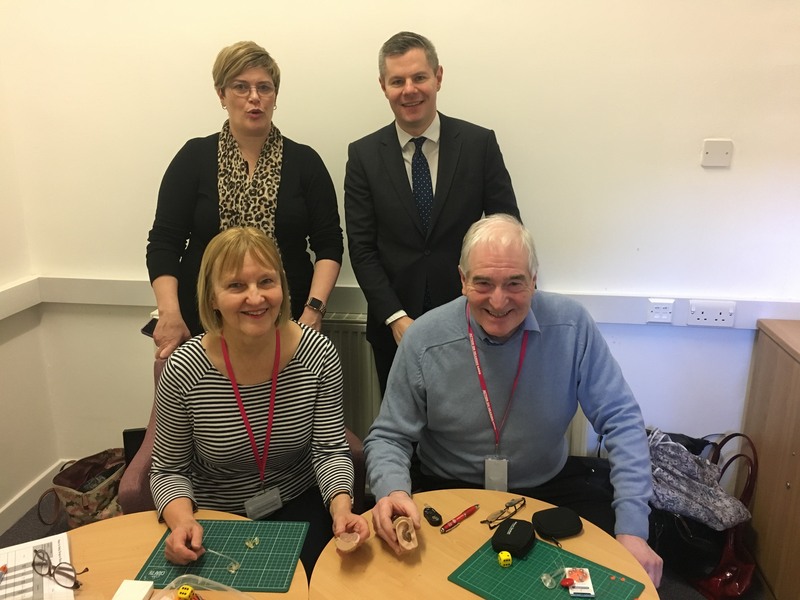 “We thank Derek Mackay MSP for visiting our new drop-in service in Renfrew Library to see how we help people experiencing difficulties with their hearing aids to hear their friends and family more clearly.